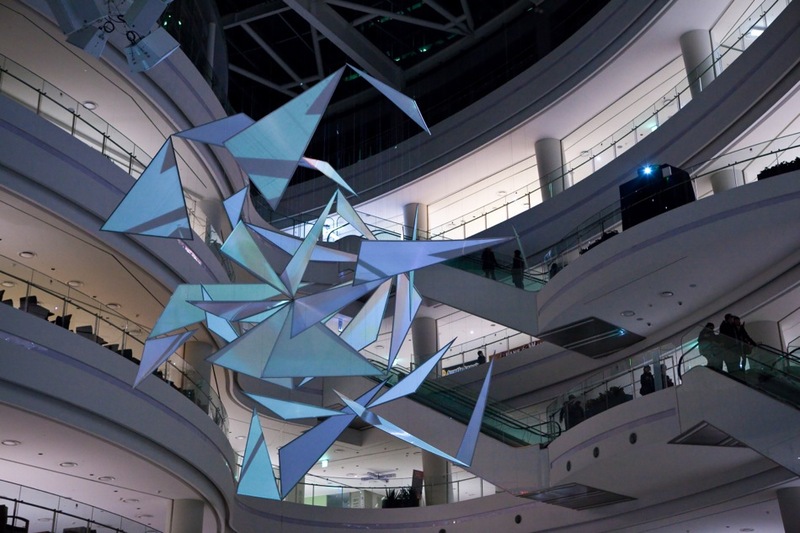 A snow covered landscape is one of the most magical things that never seizes to enchant people, so when Time Square shopping centre asked for a winter installation for their large atrium space, the inspiration came from the infinite varieties of crystal shapes that create this natural miracle. At first glance this complex 3-dimensional constellation appears to be a clean abstract sculpture, perfectly in tune with the surrounding architecture. It has a hint of manga-esque SciFi, a frozen comet traveling at galactic speed. 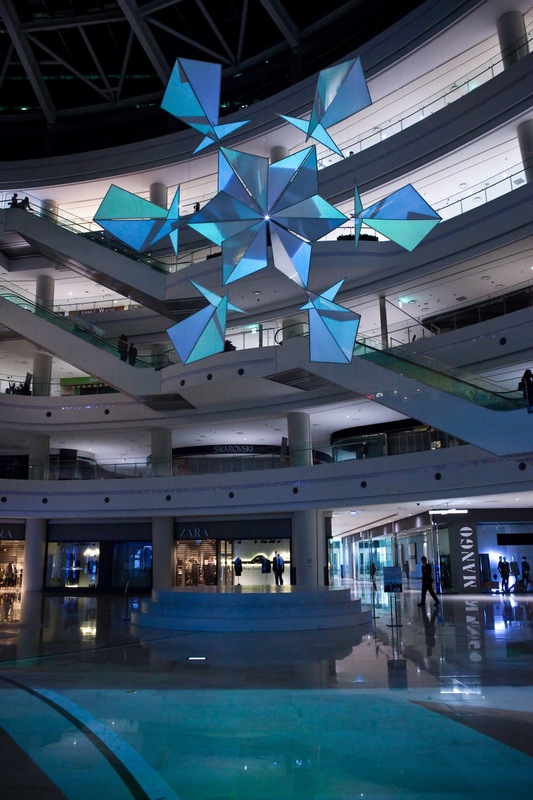 However there is a secret hidden within the 3D composition: the galleries and floors of the shopping center allow for many different viewing angles and vantage points, and hidden and yet in plain view there is one magic spot that unlocks the secret of the snowflake. The installation is illuminated by a large cinema projector and as a festive message it plays video footage from London, that was treated by a specifically designed kaleidoscopic filter, to match the hexagonal symmetry of the snow crystal. 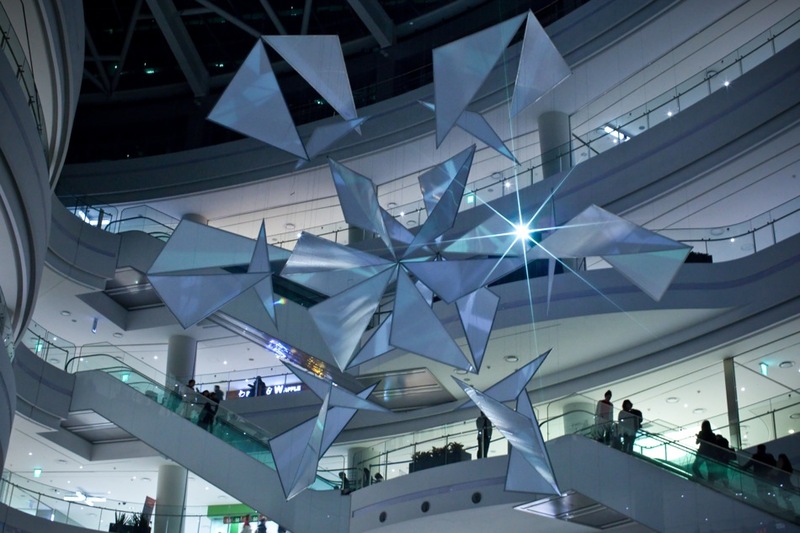 Snowflake sculpture – Time Square Seoul from moritzw on Vimeo. This entry was posted on Monday, February 6th, 2012 at 5:54 pm. It is filed under ALL PROJECTS, LIGHT DESIGN. You can follow any responses to this entry through the RSS 2.0 feed.